In the early days of Gold Rush California, murder and mayhem were the order of the day. And for a time, perhaps no class of rogues spread so much terror as the Australian ex-convicts of San Francisco. Thousands of Aussies crossed the Pacific to try their luck in the goldfields. Many gained honest employment, worked hard, and raised families. But others, according to Terry Smyth’s book “Australian Desperadoes,” arrived with thieving in mind. Portsmouth Square, the historic heart of San Francisco, circa 1850, where John Jenkins, a so-called Sydney Cove, was hung from a beam. 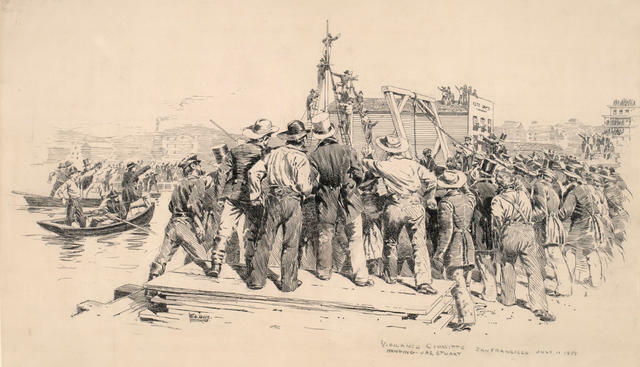 Ex-convicts from the British penal colonies in Australia formed a gang in San Francisco known as the Sydney Coves — after the prison slang for “fellows” or “chaps.” As Capone later ruled Chicago, the Coves dominated the underworld of mid-nineteenth-century San Francisco at a time when the city swarmed with rough men chasing fast riches. 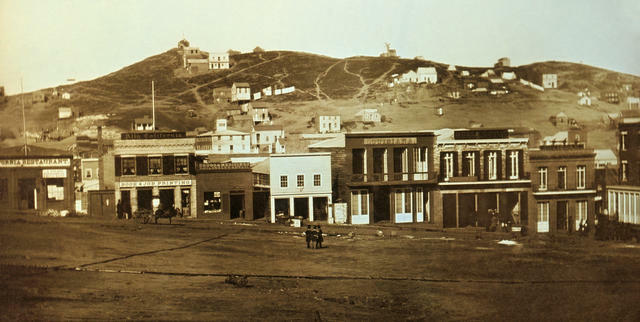 Their base of operations was Sydney Valley, three city blocks of gambling rooms, brothels, and other dens of iniquity that sprawled from the slope of Telegraph Hill near the waterfront. The gangsters wore cabbage-tree hats, carried bowie knives, and were said to walk with “swinging gaits” adopted during years in leg irons. Among their ranks were swindlers and thugs with nicknames like Big Brummy, Dutch Charley, Singing Billy, and the gang’s leader, Long Jim Stuart, a tall, curly-haired killer who wielded .44 caliber double barrel pistols. 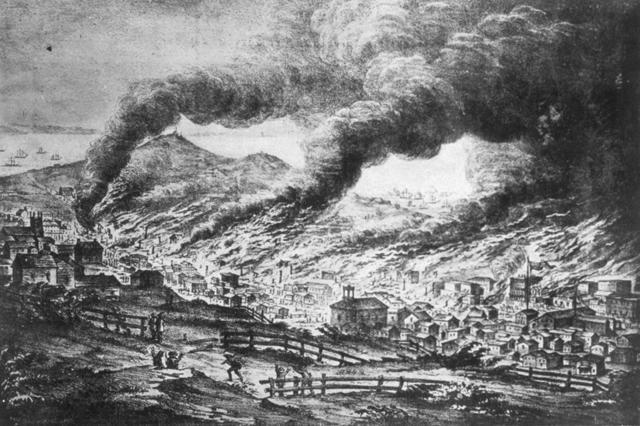 A depiction of a devastating fire in San Francisco on June 22, 1851. The Sydney gangsters were blamed for burning the city at least a half dozen times. Anti-foreigner paranoia was on the rise in California, and San Francisco’s crusading press seemed to lay every manner of criminality at the feet of the swaggering colonials in Sydney Valley. Even so, writes Smyth, their reputation for treachery was well earned. The gangsters' stocks-in-trade were highway robbery, murder, and arson, a maneuver employed to create chaos so they could loot homes and businesses. Some shopkeepers paid the Coves to ensure that their places wouldn’t be torched. 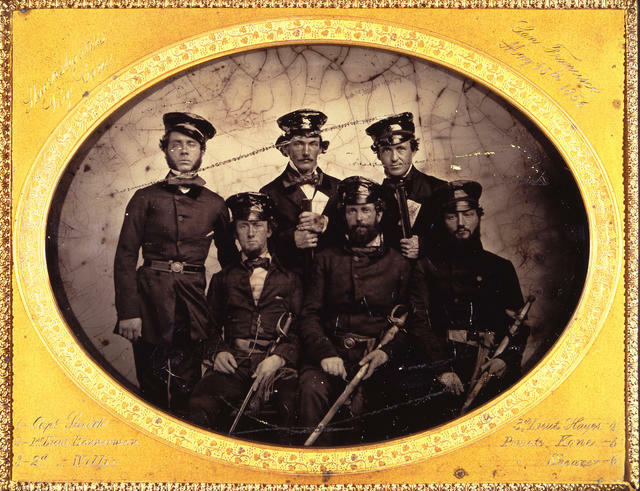 Sharpshooters of the Committee of Vigilance in 1856. Anger over the criminality of Australian gangsters was a catalyst for its formation. On this week in 1851, they got their first victim, a Sydney Cove by the name of John Jenkins who was captured after stealing a safe and lynched that very night. Before long, the vigilantes spotted Stuart himself walking along the road. Captured, he gave up the names of about two dozen members of his crew, making outlaws of them all. The chase was on. At least three more Coves were lynched, including Stuart, while others were sent to prison or deported to Australia. Many of the rest simply scattered. It was over. The criminal enterprise lasted just two years. The lawlessness of Sydney Valley, however, lingered. The area became the Barbary Coast, an empire of vice that endured for more than a half-century. The strip clubs that today dot Broadway in downtown San Francisco are said to owe their lineage to the Australian gangster-entrepreneurs that first set roots there. 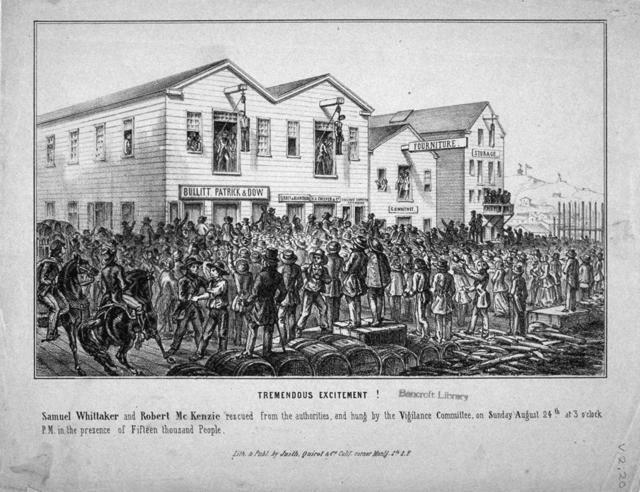 A depiction of lynching of Samuel Whittaker and Robert McKenzie, both associated with the Sydney Coves, who were hung from beams before a jeering crowd said to number in the thousands.